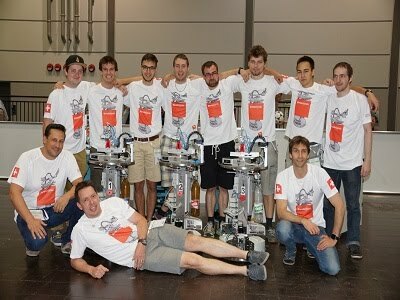 After 10 years the RoboCup took place again in Germany. The concept of the RoboCup Industrial League was established as the union of the Logistics League and @Work League. Both leagues organized a Cross-Over Challenge. A new developed communication interface enabled the teams to transfer orders from the @Work league to the Logistics league and conversely a robot arm delivered the produced product back to the @Work league to recognize it and to deliver it to the right customer place. 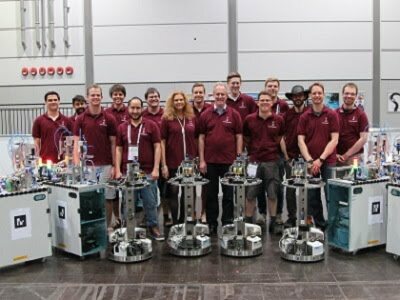 This year three new teams GRIPS (TU Graz) from Austria, ER-Force (University Erlangen) and SmartBots (University of Applied Sciences Ulm) from Germany took part in the Logistics League. All teams were encouraged by a workshop organized by the RWTH Aachen and supported by Festo. It was a great surprise that the newcomer team GRIPS from Austria could reach the third place. Congratulation! 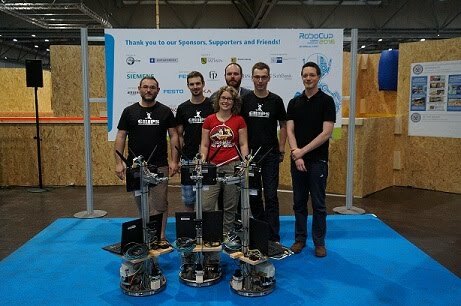 The highlight was again the final between the teams Carologistics from the RWTH Aachen and Solidus from Switzerland. At the end the Carologistics team could defend their championship from last year.